Experience ultimate sophistication when serving your cold sake with our elegant Deluxe Gold Leaf Sake Set. Cast from tin and gilt in gold leaf, this premium sake set consists of a single carafe (katakuchi) and two cups (ochoko). It comes packaged in a presentation box, ideal as a gift. The set is handmade in Japan by master craftsmen at Nousaku foundry in Takaoka City, Toyama Prefecture, a centre for industry since 1609. Tin is a fabulous metal to work with and suits cold sake service ideally. Like silver it has a wonderful, elegant finish but does not rust easily nor will it readily tarnish in air. Tin is also antibacterial and is known as a material with low allergic reactivity and high heat conductivity. Tin ware cooled in a refrigerator for 2-3 minutes will keep you sake wonderfully chilled! Nousaku foundry uses 100% pure tin. It is common to add other metallic materials to provide durability and facilitate cutting work, but Nousaku uses tin without any additives. Once cast and polished, gilding is performed by craftsmen in Kanazawa, Ishikawa prefecture. Delicate, beautiful and elegant. A fantastic addition for any sake enthusiast. Why not have a look at some sakes to go with your brand new set? 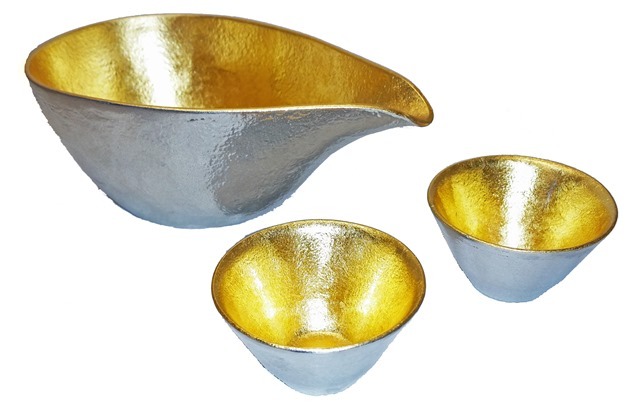 We would recommend cold sake be served in this set (pop your Deluxe Gold Leaf Sake Set in the fridge first as this will help keep the sake chilled). Have a look at our sake shop to get some ideas. Simply click on the ‘cold’ pictogram to find the sakes we recommend serving cold.